Fresh applies to everything at Restaurant Satto. From local island fish to the tofu, this Okinawa City restaurant prides itself on having everything just perfect. The fish served at Restaurant Satto come from ocean waters off Ishigaki, making it from the water to the restaurant in only hours. It’s so fresh, even local fishermen make it a point to dine at Satto. The atmosphere’s definitely Okinawan, from the traditional style entrance that hides the interior from outsides, to an interior replica of an old style home. The traditional Okinawan minyo folk music provides ambience, while the bright and polite ‘Irasshaimase” greeting by waiters and waitresses makes everyone feel right at home. The colorful selection of fish may be ordered ala carte, or as part of a Gajumaru set with five different fish, all your choice. The tofu is fresh, made right on the restaurant premises. It’s available as a tofu salid with lettuce and pine seeds with sesame dressing, or as soft tofu served with absolutely fresh, crispy vegetables. Soki soba, an Okinawan soba with pork ribs at ¥680 leads the lunch menu, together with Donburi with topping of choice and soup, drink and appetizer for ¥800. There’s also a tofu soup set for ¥750. Rafute, an Okinawa style simmered pork at ¥600, headlines the dinner menu, along with a loin steak or spare ribs for ¥980, California rolls for ¥650, and Yakotori at ¥280. 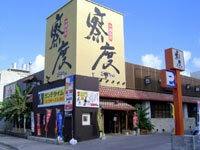 Restaurant Satto is near Camp Foster. Take Route 58, passing Kitamae Gate on Camp Foster, then turn right at the first traffic light after the Kitamae Gate. Travel toward Tropical Beach, and turn left at the first traffic light.